In early May I learned Hewitt Homeschooling was coming up as a vendor for a Crew Review. I love materials from Hewitt Homeschooling! And we were being offered a huge variety to choose from. My student is in high school, so that narrowed down my choices. I finally settled on asking for British Medieval . I liked the literature it covered as they were mostly titles I already owned. 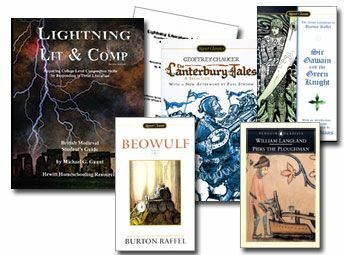 The beauty of Hewitt Homeschooling Lightning Lit & Comp materials is the way the teach the student because it has the student read classic literature and write compositions in response just the way they will have to in their college English classes. The materials arrived. I received the Student's Guide and the Teacher's Guide. I'm the student on this one this time and when new school books come in the mail I feel like a kid in a candy shop! I can't decide what to "taste" first, and it is hard for me to settle down and really get started. When I was finally able to slow down and focus, I began by reading the Student's Guide Introduction. I love the Lightning Lit Introductions. They start by talking to the student about who they should take this course, why to read literature and how to read literature. They also discuss how to read poetry. The Introduction discusses aspects of poetry: vocabulary, syntax, alliteration, assonance, rhyme and meter. Poetry can be easier to read an easier to understand if you read aloud. The author recommends the student consider memorizing poetry, and I am humbled to remember the original tradition of story-telling involved individuals memorizing classics like The Odyssey and Beowulf for the purpose of its retelling. Wow! The Introduction then teaches the importance of learning to write well. Although it comes more naturally to some than to others, it is a skill that can be learned. The book discusses brainstorming, topic statement, research, outlining, and steps to turning the outline into a final product. The Introduction also (of course) discusses how to use the Student's Guide. There is information about what to do with the Lessons and what to keep in mind while you read. I really like that the Guide recommends the student keep a vocabulary notebook and a reading journal. Next the Student's Guide jumps right to Unit 1, Lesson 1: Beowulf. Before starting Beowulf, I took a look at the Teacher's Guide. The Teacher's Guide is 85 pages, plain white 3-hole-punched paper, stapled. I will probably get this put into a 3-ring binder sometime -- not having it in a binder causes it to get beat up. The Teacher's Guide also starts with an Introduction, so I started reading again! The Teacher's Guide Table of Contents is linked on the Hewitt website. The schedule is available in both the Student's and the Teacher's Guide for both a one semester schedule and a full year schedule. The material as presented counts for 1/2 credit. For one full credit the student would need to complete two Hewitt high school Lightning Lit & Comp titles. Another option is to spread the material out over the course of a full year and supplement it with other English work such as grammar and further study such as author studies. I began my studies of Beowulf. I was surprised as I read, because I have apparently read it before. I didn't remember that I had read it. The only thing I can figure is that I must have led my oldest daughter's literature class when they were studying Beowulf. In my defense, that was about 20 years ago. Yes, it really was. I was able to understand the story better this time because the introduction explained some things I just didn't figure out the first time. I really got into the story and just wanted to enjoy it, so I was frustrated to have to stop and answer the comprehension questions. I know this must be how my students sometimes feel, but at the same time it causes one to slow down and think more about specific aspects of the literature. The Teacher's Guide provides checklists for writing assignments followed by a grading template for grading the writing assignments. I love the sheets provided for the units to help the teacher come up with the grade. Grading has always been very hard for me! There are ten aspects given to consider when evaluating the student's work (giving a score from 1-10), and then you add the ten scores together to get the final grade. Great grading method. And when the student understands what things contribute to the final grade, it is easier to pay attention to detail. There are also templates for grading comprehension questions and for vocabulary work. The final grade consists of 80% writing assignments, 10% comprehension and 10% vocabulary. I decided to try to work at the one-semester pace, knowing that I might have to slow to the full-year pace if my life got too hectic. Week 1 involves completing the Introduction and the first half of Beowulf with the comprehension questions. Week 2 finishes the reading of Beowulf and calls for the Literary Lesson for Unit 1 Lesson 1. 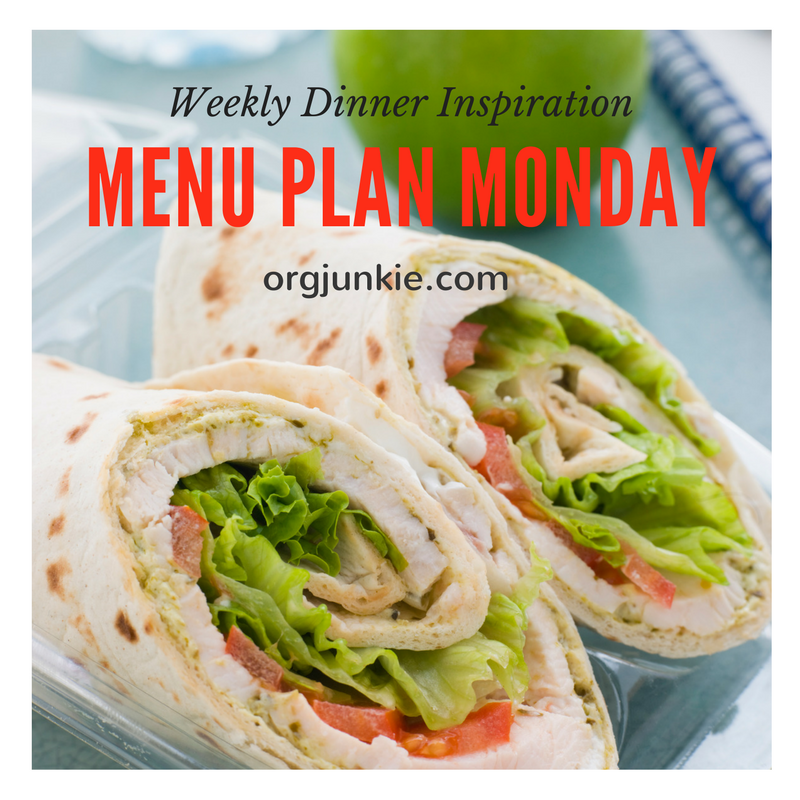 Week 3 gives a choice of Writing Exercises and calls for a rough draft. The student begins Lesson 2, Anglo-Saxon Riddles, and comprehension questions. When you understand the riddles, they are so funny! Week 4 had me finalize my Week 3 paper and begin a second writing project. The reading for this week was "Old and Middle English". Week 5 finally let me start Piers Plowman. I had never read it before! It is so funny, what I've read so far. By now I really had to slow down; life is busy. I haven't finished my week 5 work yet. Doing the British Medieval work on my own has been fun, but I am glad I don't have to grade my own writing assignment. It is hard to be objective about your own work. I have also had difficulty in the past being objective about grading my own kids' writing. I like the way the teacher materials tell the parent not to unnecessarily mark everything wrong. I always struggle with that. As the teacher, make positive comments and keep criticism unemotional. I'm not good at that, either. Avoid rewriting the student's work. I am working on it. British Medieval is a fantastic program. The Hewitt Lightning Lit & Comp materials are all fabulous. I have previously talked about British Mid-19th Century and the Gr 7 Lightning Lit Set and I loved them both. I've never tried a Hewitt Homeschooling product that I didn't love. Give them a try! Other members of the Homeschool Review Crew reviewed various Hewitt Homeschooling products. Click on the button below to see other Crew reviews of Hewitt Homeschooling products. This school year began a year ago when we transitioned school years in June. 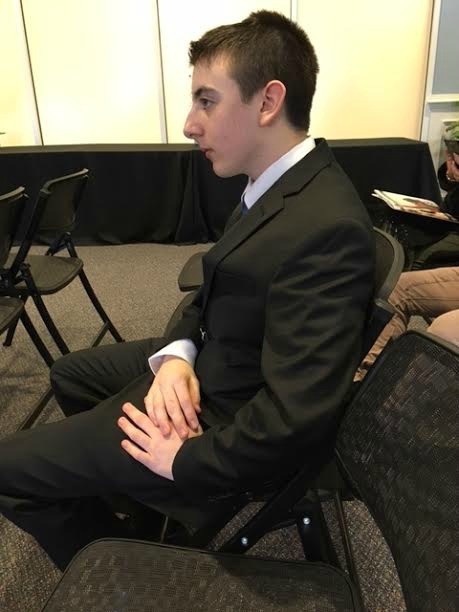 The first summer event of note was when the student went on his first job interview at Trader Joe's for a summer internship. He got the job! 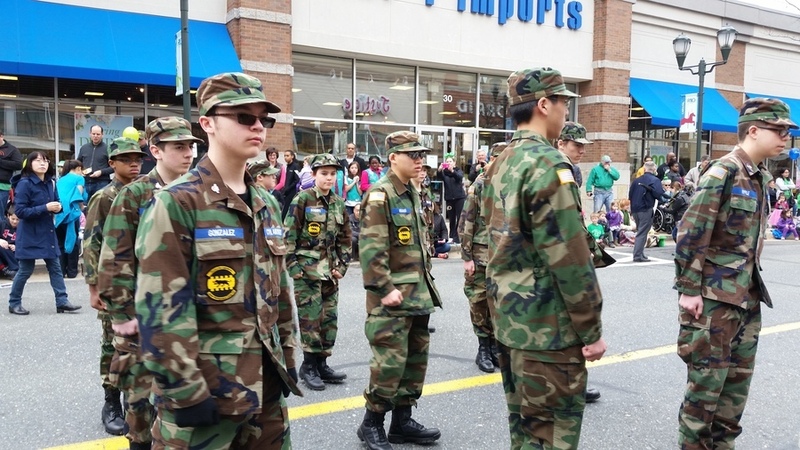 Before beginning his summer job, the student went to Civil Air Patrol Summer Encampment at Aberdeen Proving Grounds in Maryland. He had a great time, but doesn't want to do it again! For the rest of the summer he worked at Trader Joe's. At the end of the summer we squeezed in a quick trip to Assateague for a mini-vacation. 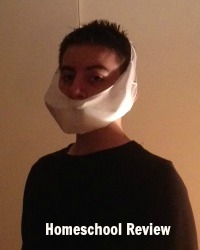 Then in August we got his wisdom teeth out. He also got to enjoy the Demolition Derby at the County Fair. Quickly enough it was the first day of school. The student took dual enrollment classes at the local community college in addition to the subjects he studied at home. In the fall he took ENGL 102 and HIST 135 and in the spring he took SOCY 100 and SPAN 101. 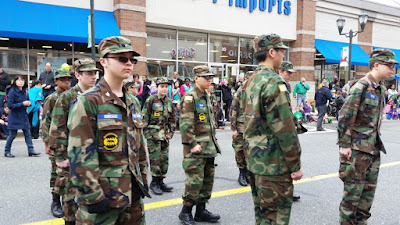 He also stayed active all year with Civil Air Patrol and Boy Scouts. In January the lad got his driver's license! In February he completed his Eagle Project with Boy Scouts. After that he finished up his Eagle paperwork and in April he passed his Eagle Board of Review. In May we had an Eagle Court of Honor for FIVE young men in our troop who achieved the rank of Eagle this year. Shortly after that he had a foot surgery, from which he is now mostly recovered. 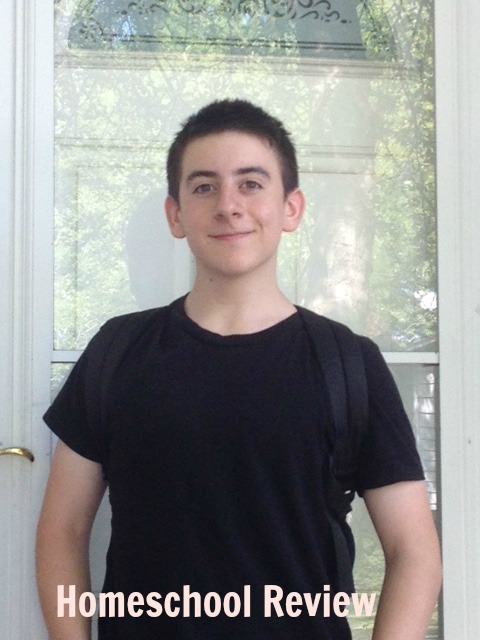 He completed all his course work for the year and rolled right into senior year with a summer course at the community college! So that is a brief synopsis of 11th Grade. Thanks for reading! Back in May I learned I would get to be on the review for Homeschool Planet. The product we received to review was a one-year subscription to Homeschool Planet. I had the opportunity to review Homeschool Planet in the past, and I wanted to review them again to see the improvements and changes that have been made. As soon as I received access I began entering information. To begin, I entered the information for our busy summer. 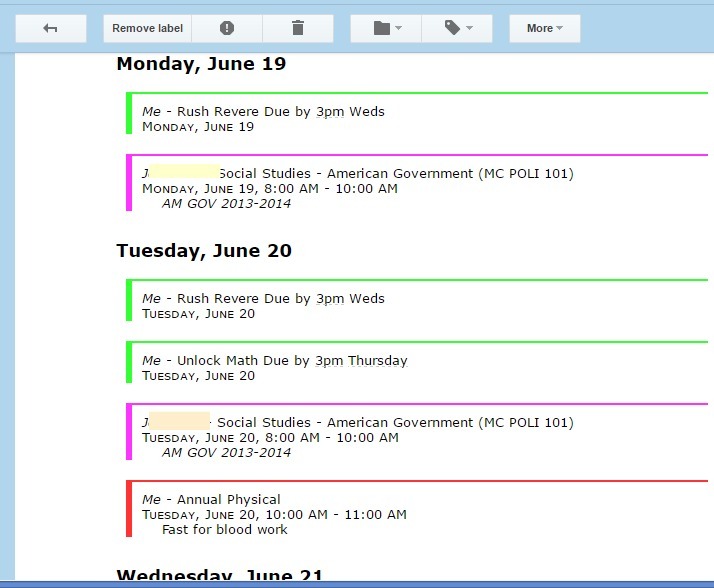 The student is taking a college summer semester course through the dual enrollment program. His class meets Monday through Thursday, 8:00-10:00 a.m. I found it possible to enter this information. Either this feature has been improved or I just didn't figure it out before. There is an option, now, to select which days of the week the class will meet. 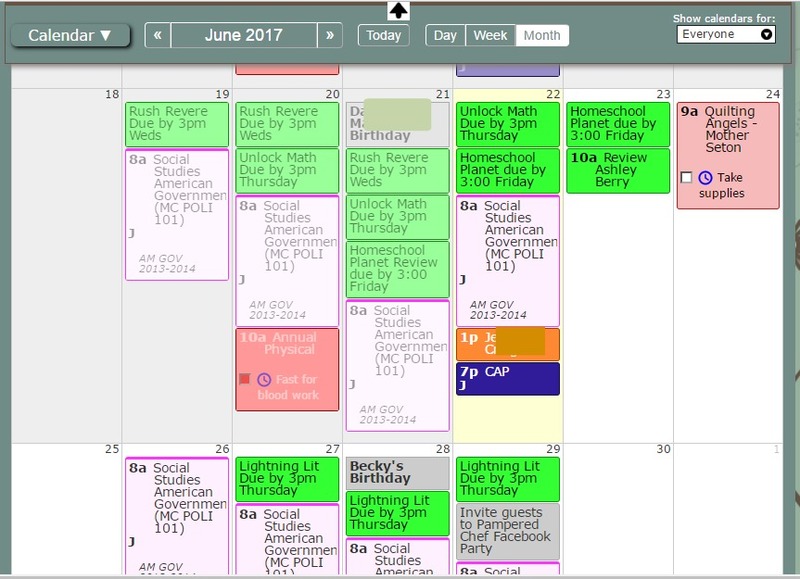 Later you can adjust time on specific days. For example, in the fall my student has a class that meets on Tuesdays and Thursdays. 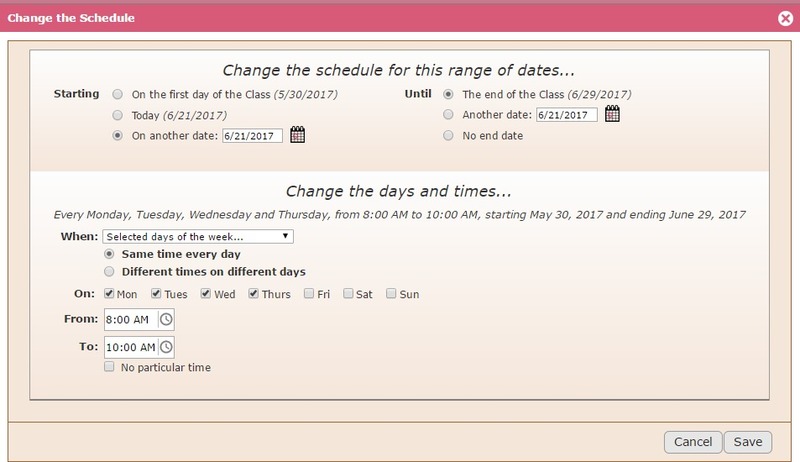 I created the class indicating that it meets from 12:30-2:00 p.m. However the class only meets at this time on Tuesday. On Thursday the class meets from 1:00-2:00 p.m. It was easy to go in and make that adjustment. As the day goes by, the color fades, making it easy to see where you are on the schedule. Once a week an email is sent to each email address you've given the program, letting the individual know what's coming up for the week. In addition the program generates a daily email showing what's coming for the day. In addition I found I can add a widget for a shopping list, which I did. This is going to be so helpful for me! When I'm ready I can print the list or send the list! If my husband calls on the way home from work and says, "Do you need anything from the store?" I can email the list to him. It wants me to put a store name down, and I think it should be able to have a list for more than one store. I guess I would add another "Shopping" list widget to do more than one store list. Also, did you notice my background color change? The original color was very pink, and I found a way to change it to a pale blue that I like better. Homeschool Planet has a new feature: Lesson Plans. For the month of June, anyone who tries out the "Free 30 Day Trial" receives one free lesson plan. I was planning to use BJU Geometry next year, and Homeschool Planet has a Lesson Plan for that, so they gave me a BJU Geometry Lesson Plan to try out. Things are always hopping here, and before I could enter my BJU Lesson Plans into Homeschool Planet, we had to have a family meeting with the student about Geometry. The student and the teacher were both struggling with working together. The student feels the teacher doesn't teach well, doesn't have a plan, and doesn't adequately hold the student accountable. The teacher does have a plan, feels the student doesn't respect this teacher the way he does other teachers, and concurs there is difficulty with accountability. All concerned decided to enroll the student in Geometry as an outside class with a local organization that conducts classes for home schooled high school students. We did. So now we are no longer going to be using BJU Geometry. We are going to be using Saxon. 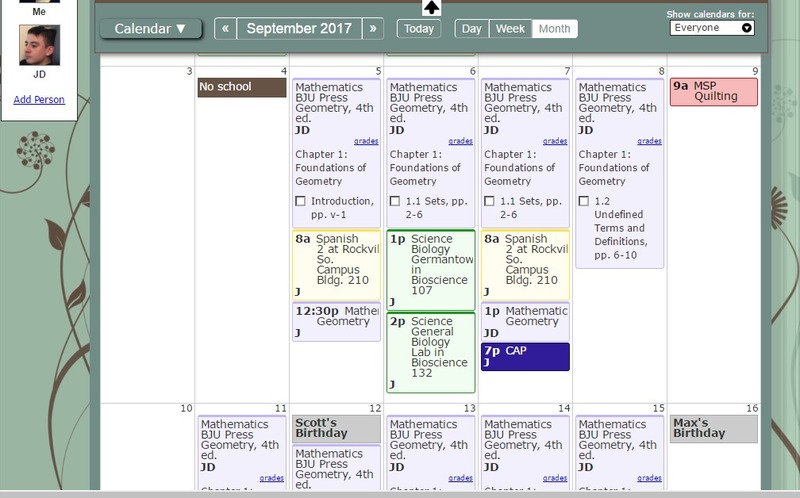 I found Saxon Lesson Plans on Homeschool Planet, but not Saxon Geometry. It really wouldn't matter -- my son is going to need to follow the Syllabus handed out by his class, so I'm not sure a pre-created Lesson Plan would work for the class my son will be taking on Tuesdays and Thursdays. I still needed to be able to try out the Lesson Plan for BJU Geometry so I could tell you about it, because I had agreed to do that. So rather than muck up "J"s schedule with a class he is not really taking, I created a second profile for him called JD to use to set up the BJU Geometry Lesson Plans. I was able to set up the Lesson Plan with ease once I had watched the Lesson Plan Tutorial. And at the end of the tutorial it mentioned that there are a lot of tutorial videos available for Homeschool Planet. I had known that but had not previously found the tutorials. I have found Homeschool Planet intuitive enough to use without instructions, so I was doing fine before, but now I know I will be watching tutorials. I'm sure there is a lot I still don't know yet about Homeschool Planet that I will learn from them. 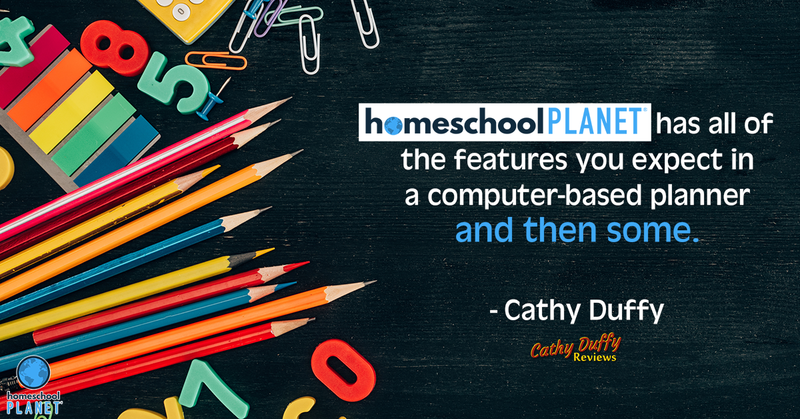 I highly recommend Homeschool Planet to you for your home school and your life! Go take a look and try it out for free for 30 days. Receive one set of Lesson Plans for free. I think you are going to love it like I do. Other members of the Old Schoolhouse Homeschool Review Crew also reviewed Homeschool Planet. To read additional reviews please click on the button below. 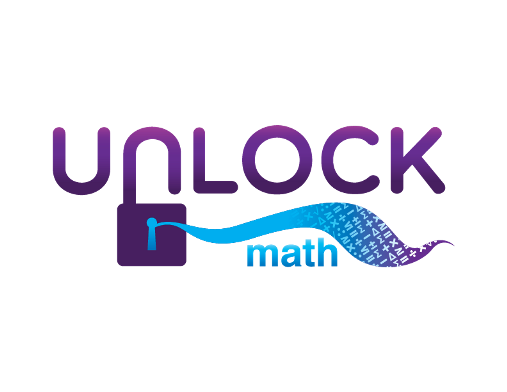 My son still needs to complete Geometry, so I was pleased when I saw UnLock Math was coming up as a Vendor. They have a course that was a perfect fit for us called UnLock Geometry. UnLock Geometry is presented as a complete course, which was a fabulous fit for us. Over the course of one school year (which is 180 school days), doing approximately one lesson per day, the student will complete the course by the end of the year. My son was willing, and even interested, so we volunteered. When the program information arrived, I set up our account and got my son going. My son logged in and began working on the program. The first night, my son came into the living room at dinner time and said, "I'm not going to lie... This is pretty cool!" Another night, again at dinner, he said, "Right now I am learning about the Pythagorean Theorem!" Things seemed to be going smoothly. I myself was busy with many things, so I was glad it seemed my son was doing well with this program. 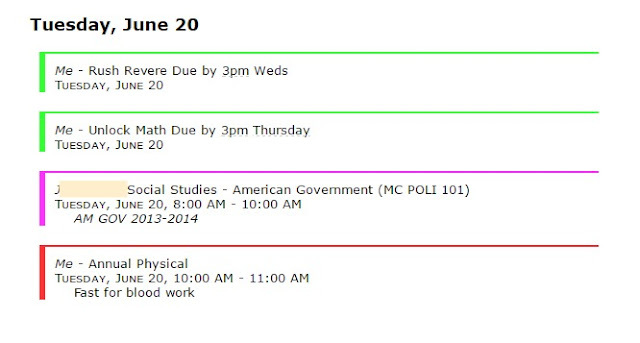 He has also been taking a summer dual enrollment college course, so I knew he was busy as well. Then the Saturday came when my son took the ACT test. He came home, upset, feeling he had not done well (and blaming me and my shortcomings in teaching him!). After talking things through, what we learned is that my son needs more accountability than I have been giving him, and that even with UnLock Geometry he had not kept up his regular lessons as I had thought he was doing. In his defense, he was right. It is easy enough for the parent to check the student's account to confirm his regular progress, and I had not been doing it. My son had given up on UnLock Geometry. So, to fulfill our commitment to the vendor I knew I had to jump in and act as the student. It's easier to write a review when I am really familiar with the product, anyway, so I did my best. First I found there is a four-page "UnLock Math Quickstart Guide" to help you know how to use the program. There is a similar pdf download teaching how to access and use the Gradebook, UnLock Math Gradebook Guide. So, each UnLock Geometry lesson starts with "Warm-Up" which reinforces materials previously covered. 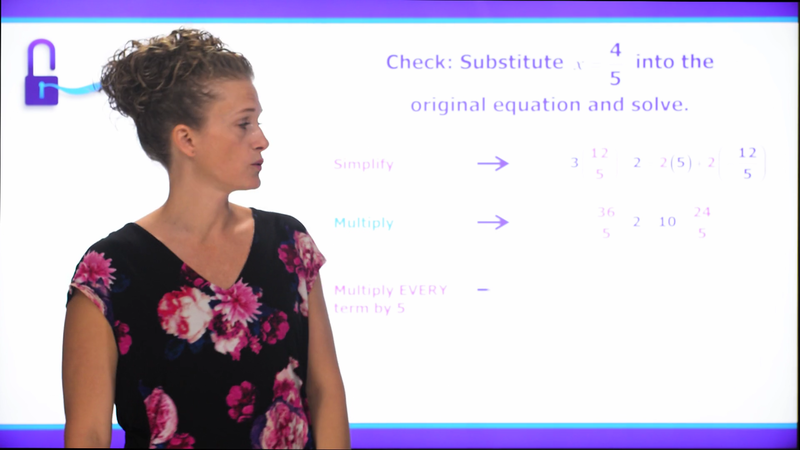 Step 2 is a Lesson Video, followed by Practice Problems. The student also completes "Stay Sharp" and "Challenge Yourself", and they are done. "Reference Notes" is the material presented in the lesson and is a pdf with can be saved and printed. So I began working my way through the material, and I like what I see. The video teacher presents the material well in a way that is easy to understand. I recommend this program to you! This Geometry program is UnLock Math's brand new product. So now that you know I love it, I do need to let you know a few issues I had with the program. The folks from UnLock Math should also be reading my review, and I expect they will work to remedy these issues. Yes, I find that difficult to see. Another issue I had was where the program marked a correct answer wrong because it wanted me to abbreviate a certain way. The question was something like, "14,000 pounds = how many tons?" I answered 7 tons, and it wanted me to say "7 tns". I don't know how well you can see this, but in the above screenshot you can also see how they explain the process to get to the correct answer. These explanations are always there and they are excellent! 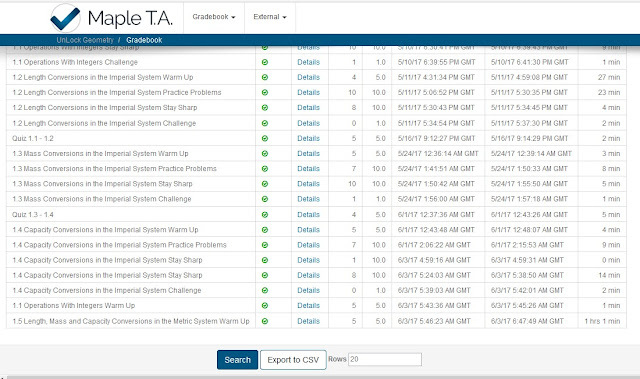 From the parent pages you can see what problems your student had trouble with and can follow up. There are so many layers to UnLock Geometry that it is difficult for me to share everything. I imagine there are things I have missed that might be of interest to you. Fortunately for you, other members of the Homeschool Review Crew also reviewed UnLock Geometry and other programs by UnLock Math. You can read other reviews by clicking on the button below.